Available in a vibrant variety of velvet hues, the Ashley Velvet Sofa also offers the lush comfort of dense memory foam within a simple clean-lined design featuring just enough contoured curves. 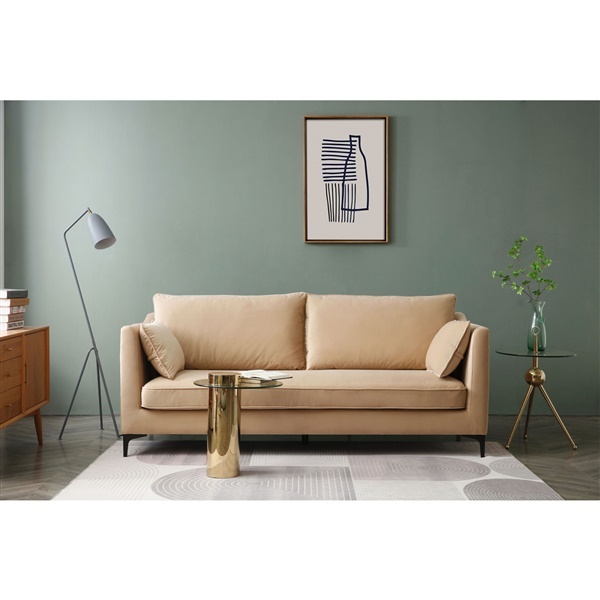 Cleverly bringing together classic sophistication and contemporary streamlined style, the Ashley Velvet Sofa securely sits atop slender yet stable metal legs that add the subtly glamorous gleam of a soft gold finish. Your choice of bold and vibrant color options. Expertly upholstered in luxuriously rich velvet. Stable metal legs with gleaming gold finish. Never in my wildest dreams did I think I would own an entirely velvet sofa but here it is! AND I LOVE IT! Glad I stepped outside of my norm and went for something different! It was a toss up between the green and blue, i went for the green and I couldn't be happier with my purchase! Really great quality couldn't believe the price when i saw it either, thank you inmod!! I ordered this in the sapphire blue color and it is stunning. It arrived in perfect condition and assembled easily. The gold base is the icing on the cake. It is super comfortable and stable. Delivered quick. I would purchase this all over again. A+ overall for product and experience. The sapphire blue velvet fabric is absolutely gorgeous. Compliments my home well. Very happy with purchase. Are the two back cushions removable? Yes, the back cushions on the Ashley Velvet Sofa are removable.